An Exercise ECG looks at the electrical activity of your heart before, during and after exercise. Exercising is an important part of this test because it can reveal potential problems with your heart. Exercise ECGs are useful in evaluating symptoms (especially chest pain), determining the effectiveness of your heart medication and your progress following angioplasty/by-pass surgery. 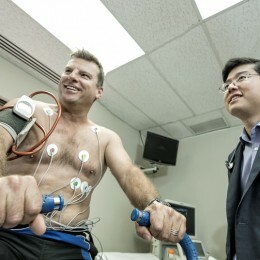 An exercise ECG is conducted on either a treadmill or bicycle. The test will begin slowly and increase in intensity every three minutes. During this time your blood pressure will be taken periodically. The doctor will encourage you to exercise until you reach a target heart rate that’s calculated according to your age and gender. You will then stop exercising and be required to lie down whilst ECGs are taken every 3 minutes for the next 15 minutes or so. It’s important that you inform the Supervising Doctor if you have any symptoms such as chest pain or nausea during the test. You will be required to remain in the practice for at least 15 minutes after the test to ensure that you have fully recovered from the exercise and are experiencing no symptoms. It’s recommended that you wear comfortable clothing and footwear for the test. For example, suitable clothing would be shorts and T-shirt or a track suit. Footwear should be a pair of comfortable walking shoes or runners. You will be instructed by your GP or Cardiologist if you need to stop your heart related medication 24 hours prior to the test. An exercise ECG takes between 45 minutes and 1 hour. What is an Exercise Echo? An Exercise Echo provides information about the function and contractility of the heart muscle before, during and after exercise. 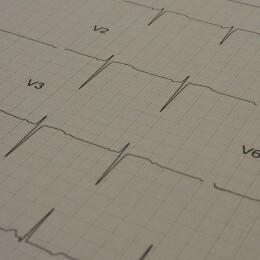 The test is very similar to an Exercise ECG. The only difference is that an echo assessment of the heart muscle will be undertaken in conjunction with exercising and ECG monitoring. The test commences with an echocardiogram that looks at the movement of your heart muscle. Whilst lying down, a probe will be placed on your chest and a series of dynamic images will be recorded. You will then be asked to exercise on a bike. The moment you reach a predetermined target heart rate, you will be assisted to lie back down on a bed where a second series of echo images will be recorded. It’s important that you inform the Supervising Doctor if you have any symptoms such as chest pain or nausea during the test. You will be required to remain in the practice for at least 15 minutes after the test to ensure that you have fully recovered from the exercise and are experiencing no symptoms. An Exercise Echo takes approximately 1 hour. What is a Dobutamine Echo? A Dobutamine Echo is very similar to a Stress Echo. It is performed on those people who are unable to perform physical exercise. Instead of exercising on a bicycle the heart is ‘exercised’ through the infusion of a medication called Dobutamine. This drug will simulate exercise by making your heart beat faster. The Doctor will insert a needle into your hand or arm and a solution containing Dobutamine will be infused slowly into your bloodstream. The Dobutamine gradually causes the heart rate to increase. An echocardiogram will be taken at the beginning of the infusion to look at the function of your heart muscle. Once your heart reaches a predetermined heart rate, a second series of echo images will be recorded. It’s important that you inform the Supervising Doctor if you have any symptoms such as chest pain or nausea during the test. You will be required to remain in the practice for at least 15 minutes after the test to ensure that you have fully recovered from the test and are experiencing no symptoms. You will spend the test lying down, so make sure to wear comfortable clothes. For ladies, it’s best to wear a two-piece outfit or dress with buttons up the front. A Dobutamine Echo takes approximately 1 hour. An Echo/Doppler is an ultrasound assessment of the heart. 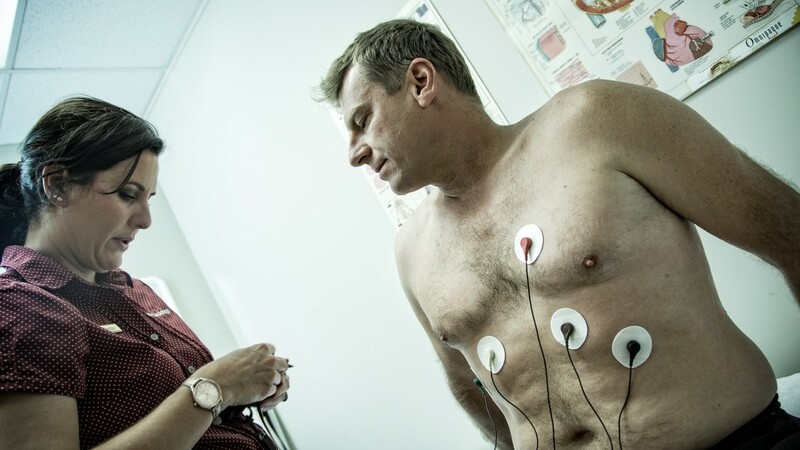 This test requires an ultrasound probe to be placed on your chest. A series of dynamic images of your heart are recorded. From those images, a detailed assessment of your heart valves, heart muscle and blood flow is performed. The information recorded and is then reviewed by a Cardiologist. No special preparation is required for an Echo/Doppler. Although it’s recommended that you wear clothing that can be easily removed from the waist up. An Echo/Doppler will take between 45 minutes and 1 hour. 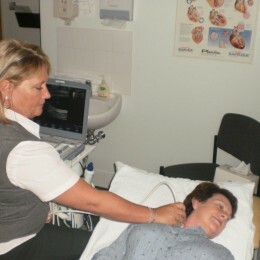 A Carotid Ultrasound is a test used to visualise the blood flow and possible narrowing of the vessels that supply blood to your brain. This test requires an ultrasound probe to be placed on your neck. A series of dynamic images of your carotid arteries will be recorded. From those images, a detailed assessment of your carotid and vertebral arteries is performed. The information recorded and is then reviewed by a Cardiologist. No special preparation is required for a Carotid Ultrasound. Although it’s recommended that you wear clothing that can be easily removed from the waist up. A Carotid Ultrasound takes approximately 30 minutes. What is 24 hour ECG Monitoring? A 24 hour ECG Monitor continuously records the electrical activity of your heart as you go about your normal daily routine. It’s used to detect and assess abnormal rhythms of your heart and their relationship to any symptoms you may be experiencing. A Cardiac Technician will place three electrodes on your chest that are then attached to a small monitor. You will be required to wear the monitor overnight and return it the following day. A diary will be provided for you to note down important activities (eg exercise, housework, gardening etc) and any symptoms (eg chest pain, palpitations, etc) that you may experience can be entered into the device. As you will be wearing the monitor for 24 continual hours, you will need to shower or bathe before the fitting. For ladies, it’s best to wear a two-piece outfit or dress with buttons up the front. For gentlemen, the recorder can be worn on a waist belt and covered with a suit coat. You will need to return the monitor to the site that initially fitted the monitor the next day at a specified time. It is very important to return the monitor by the time requested, as another patient will be scheduled to use it. A 24 hour ECG Monitor takes approximately 30 minutes to fit and explain. What is a Multi Day Holter Monitor? A Multi Day Holter Monitor continuously records the electrical activity of your heart for up to a week as you go about your normal daily routine. The monitor is used to detect and assess abnormal rhythms of your heart and their relationship to any symptoms you may be experiencing. A Cardiac Technician will place three ECG electrodes on your chest that are in turn attached to a small monitor. You will be required to wear the monitor for up to a week (with the exception of when you shower). You will be given a spare battery and charger which will be changed over daily. A diary will be provided for you to note down important activities (eg exercise, housework, gardening etc) and any symptoms (eg chest pain, palpitations, etc) that you may experience can be entered into the device. Each 24 hour monitoring period is analysed online and reported by a Cardiologist who will then determine whether another day of monitoring is required. Once you have returned the monitor, a summary report will be sent to your referring Doctor. There is no special preparation for this test. You will need to return to the test centre that initially fitted the monitor on the day and at the time specified. It is very important to promptly return the monitor, as another patient will be scheduled to use it. A Multi Day Holter monitor takes approximately 30 minutes to fit and explain. What is One Month ECG Monitoring? A One Month ECG Monitor is a hand held cardiac event recorder. The compact monitor is carried around in your handbag or pocket for a month, readily available to record the electrical activity of your heart on demand as you go about your normal daily routine. The monitor is used to detect and assess abnormal rhythms of your heart and their relationship to any symptoms you may be experiencing. The monitor is patient activated, which means that you must press a button on the monitor to record your heart’s ECG whenever you feel symptoms. A Cardiac Technician will explain in detail how to use the monitor at the time of your appointment. When you experience any symptoms such as palpitations or missed beats you need to record an ECG of your heart by placing the monitor on your bare chest wall and pressing a button on the machine. The monitors record up to six events. Once the monitor is full of recordings, you will need to telephone our Murdoch rooms to download the recorder and clear its memory. A diary will also be provided for you to note down important activities (eg exercise, housework, gardening etc) and any symptoms (eg chest pain, palpitations, etc) that you may experience. Once you have returned the monitor, the tracings will be reported on by a Cardiologist. 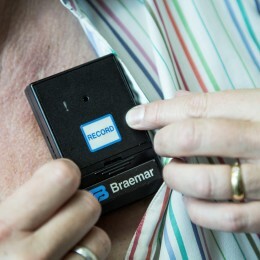 A One Month ECG Monitor takes approximately 30 minutes to fit and explain. 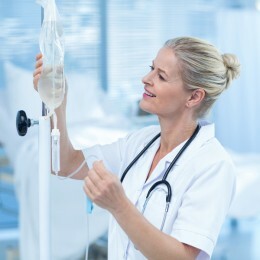 What is 24 HR Blood Pressure monitoring? A 24 hour Blood Pressure Monitor measures your blood pressure and heart rate at set times over a 24 hour period whilst you go about your daily routine. 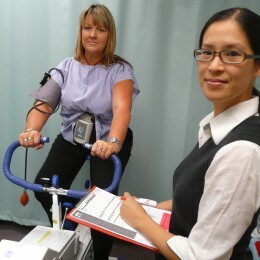 A 24 hour assessment gives a better indication of your blood pressure than just one or two readings in the office. A blood pressure cuff is placed on your arm and connected to a small recorder. You will be required to wear the monitor overnight and return it the following day. At set intervals throughout the day and night the blood pressure cuff will automatically inflate and record your blood pressure. To ensure an accurate reading, it’s important that you keep your arm straight and your body still whenever the BP cuff inflates. If the reading fails, the cuff will make a couple of subsequent inflations until an accurate reading is achieved. You will be required to keep a detailed log of your activities each time the cuff inflates, making special note of any symptoms you may be experiencing. As you will be wearing the blood pressure monitor for 24 hours, you will need to shower or bathe before the fitting. You will need to return to the test centre that initially fitted the monitor the next day. It is very important to return the monitor by the time specified, as another patient will be scheduled to use it. A 24 hour Blood Pressure Monitor takes approximately 30 minutes to fit. What is an ECG with report? An ECG with report (electrocardiogram) is a quick and simple test that assesses the electrical activity of the heart. A number of electrodes will be attached to your chest and limbs and a tracing will be recorded while you are lying down. This simple test provides information about your heart rate, heart rhythm and conducting system. It’s valuable in identifying heart muscle damage. 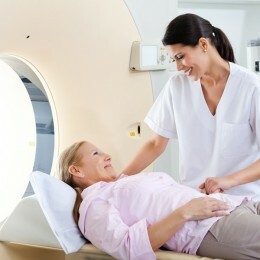 All tests are reviewed and reported on by a Cardiologist. No special preparation is required for this test. Although it’s recommended that you wear clothing that can be easily removed from the waist up. An ECG with report takes about 10 minutes. 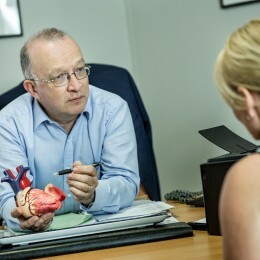 HeartCheck is a vital screening tool for coronary heart disease that could save your life.